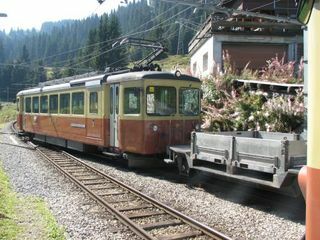 She Loves the Transportation in the Jungfrauregion! FIRST: Congratulations Chris and Jen! Marriage is fun! SECOND: Happy 24th Birthday, Teddy! During our initial planning, Saturday had been selected as the perfect time slot for a day trip away from Zurich. 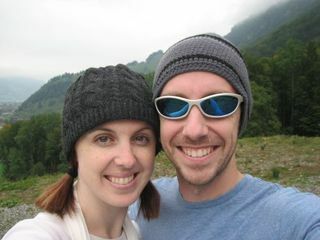 Jon and I each had the chance to choose a destination elsewhere in Switzerland. I picked Appenzell, a city on the Eastern border, which we visited on Sunday. But Saturday was Jon's pick, and so we were off on a tremendously ambitious adventure to the Bernese Alps (the so-called Jungfrauregion) and, specifically, to a tiny town called Gimmelwald nestled high on the mountainside. As of today, I am aware of no more thrilling an activity than running to catch a train. The allure of train travel lies in its perceived antiquity, though most all commercial trains used today are quite modern. One can easily imagine the delightful station platforms back when locomotive engines hissed and wheezed steam on entrance and exit, filling the room with white... or lips pressed to the palm of one departing and the subsequent kiss tossed to the one who remains in the station, fading smaller and smaller. But running for a train, either excited about the day's destination or looking forward to the trip home, is unmatched in jubilance. Propelling yourself down halls and up stairs and through turnstiles - all in the impassioned hope that you'll swing yourself aboard just before the doors close, victorious. 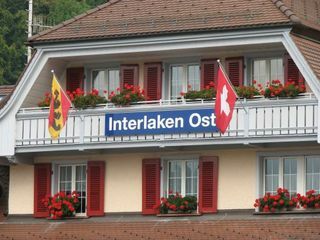 On the train ride from Interlaken to Lauterbrunnen, a wheelchair bound young man suffering from cerebral palsy began to elicit short, high pitched noises, bursts like a trumpet. He sat hunched in his chair, eyes spinning wildly, between his parents. They were unapologetic, but no one seemed to expect them to be, either. As I passed him and smiled at his mother, I thought to myself, Oh, what kind of hell would that be, locked in a crippled body and nothing to do but attempt to scream. He could have been happy; I don't know. And, as Jon pointed out, it's better that he was riding trains in Switzerland, surrounded by his family, that locked away in an institution somewhere with only the walls to hear his cries. The power of the stark, white ridge towering above the quaint Interlaken valley can hardly be expressed in words, and only a few of the 500 pictures we took that day can appear here. Let's just say that my mouth hung open in awe... that I was stunned into speechlessness... that I was overcome by the idea that God must love to yodel. Pulling into the station at Winteregg, the weather cleared for us immediately, revealing a delightfully beaming sun which rendered our heavy coats irrelevant. In the shade, though, the altitude kept the temperatures quite cold, so I decided to buy some darling (Read: Fuzzy w/ Swiss flag) gloves to keep my fingers happy. 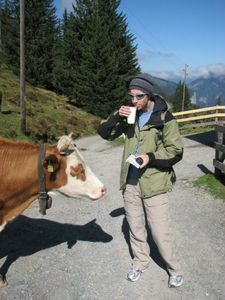 Jonathan walked up to a window at a dairy and bought a large cup of ice cold, fresh, Swiss milch . 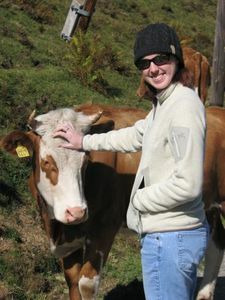 I'd been petting a sweet-faced cow who had lumbered up beside me on the road; happily, the cow was willing to pose for pictures as Jonathan gulped down the delicious liquid, grinning between each gulp. In Murren, we came upon a Dreamcicle colored kitten with an effervescent personality. The little guy batted at our fingers and chased any little pebble to pinecone we tossed for him. We stroked and patted his soft, kitten fur until finally Jonathan, ever the sucker for a pretty kitten, picked him up. I followed suit, setting down all of my other belongings in favor of the warm, purring kitten body. I cradled him and cooed over him before setting him down and tearing myself away. Only then did I realize that somewhere on the 2.5 kilometer walk from Winteregg, I'd dropped one of my brand new gloves. This realization maddened me, being as I am a very frugal person who hates to waste anything, but especially money. Jon tried to comfort me, saying we'd look for it on the way back, but we both knew it was a lost cause. We kept on, hiking through the resort town of Murren, down a winding path along the hillside between dozens of vacation cabins, along the road to Gimmelwald. Jon had selected this as his destination for the day based on some beautiful pictures he'd found during research of the area. This entire trail was in full, flagrant view of the Alps, becoming more audacious at each bend. Fields of wildflowers bloomed beside acres of farmland. Farmers swung scythes through the tall, sweet-scented grasses and raked the fragrant cuttings down the hill. And everywhere the cowbells rang. 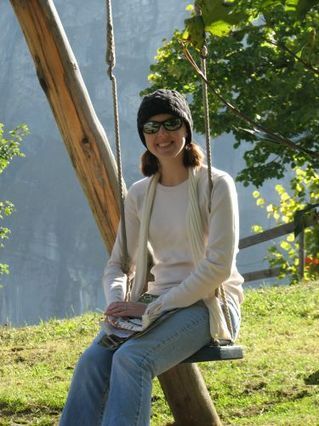 Finally in Gimmelwald, we were disappointed that the only little shop was closed (for a three hour window which just blotted out our visit), but were fortunate to find a small playground for our amusement. The tube slide was much longer than any I've seen in America, appearing more like a water chute than an elementary school playground slide. 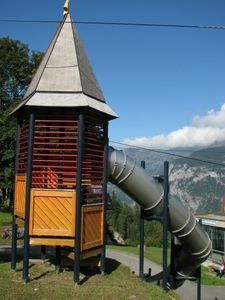 Jon took many turns on the slide as I played on the swings, pumping my legs back and forth, all the while surveying the drastic, white peaks of the Bernese Alps. The Saturday excursion was so delightful (and complex) that it required two entries. Look for the second one tomorrow. And in the meantime, keep on swingin'! She Loves the Air in the Alps!